When discussing the LGBT+ acronym, it’s always important to include the “+” at the end. This reminds us that our community doesn’t just include lesbians, gays, bisexuals and transgender people. The “+” is all inclusive, encompassing intersex, questioning youth, allies, those who identify as asexual, demisexual, polysexual/polyamorous, pansexual; the list seems limitless and is added to constantly. When you’re a part of Rainbow Alliance at Fordham Lincoln Center, you’ll always be included. At the group’s first meeting, the theme was “Ice Cream and Identities.” Members were served ice cream and talked about all the identities within the LGBT+ alphabet soup. But, before we dove into the fun, we were all asked to introduce ourselves with our name, preferred pronouns, how we identify ourselves, and of course – the most important aspect of who we are – our favorite ice cream flavor. Some used terms that aren’t common but are gaining more attention as people continue to identify themselves as such. One member said that they were pansexual, another member identified as queer. These identities aren’t completely foreign, but are less used than someone identifying as gay, lesbian or bisexual. During this first meeting, the group also debunked the misconceptions surrounding the different identities in the LGBT+ acronym. The members began to uncover some common misunderstandings about sexual identity and gender identity. We talked about the difference between pansexual and bisexual, what being aromantic means as opposed to asexual and various other topics. This meeting consisted of all the members teaching one another and clarifying these misconceptions. For example, one member said, “There’s a common misconception that bisexual and pansexual are the same thing.” This person continued to debunk and clarify why people thought this and educated everyone on the difference between the two. 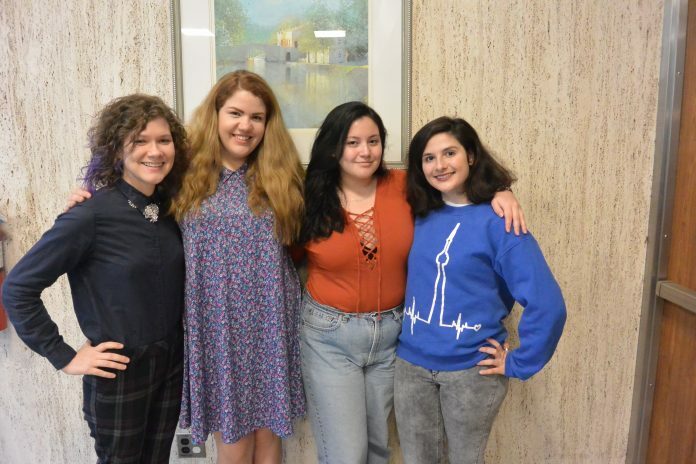 Outside of the general meetings that they hold every Tuesday from 5:30-6:30 p.m. in the Atrium, they have events throughout the school year to expand their safe space to other LGBT+ students and allies on campus. “[One event] we have [is] ‘Cue The Spotlight’ in the fall. It’s an art showcase, in which you can show queer art, if you choose, or you can come and support queer artists. The night can consist of slam poetry, spoken word, music, etc. People have also shown paintings that they’ve done,” Auge said. Their biggest event of the year is Queer Prom, which, even if you’re not a part of the LGBT+ community, you should be excited for. Auge explained, “At the end of the year, we host Queer Prom, which last year was Rocky Horror-themed. It’s a fun time to listen to music, dance and eat free food. There’s always free food.” Anytime a club mentions free food, everyone knows that students will always attend. Auge also mentioned that the group is looking into a trip to Big Gay Ice Cream downtown in East Village. In addition to its exciting events planned for the year, Rainbow Alliance is one of the most accepting and inviting groups on campus. You don’t have to be queer to join and if you are queer, they’ll make you feel proud to be queer. If you need a reason to join Rainbow Alliance, here’s what the president of the club had to say: “Rainbow is an accepting place, it’s a safe space for all to come and be who they are. It can also provide a space to learn about themselves and learn about others.” Auge explained that in Rainbow, you build a sense of family “that you really grow to care about.” If you’re still figuring yourself out, Rainbow Alliance is a safe and comfortable community to utilize. Those who argue that safe spaces are part of a liberal agenda propagated by the “PC-police” unwittingly argue for people to feel unsafe. Safe spaces have historically been places where groups of people with common characteristics can join together and feel secure in the environment because they feel insecure in the larger general community. Safe spaces have been misinterpreted and the definition and purpose have been misaligned by the media, but the root issue and purpose remain. The Fordham community was shaken up by a bias incident almost as soon as the school year commenced. On Sept. 3, residents of Finlay Hall woke up to find a message on their white board that was quite clearly offensive and intolerable. Our community cannot allow vicious attacks like those seen far too often — harassment of a group of people that serves to destroy our community. The school rightly believes, based on the Latin root of the word, that a dormitory is a mere place to sleep. By contrast, a residence hall is a place to live, to grow and to develop into men and women for others. In other words, a residence hall is a temporary home, and a home is a place where residents feel the utmost security. The development of character Fordham expects from its students cannot occur as long as any of us feel unsafe in our homes. On tours, I often get the dreaded safety question: “Do students feel safe off campus?” What anxious parents should be asking is if students feel safe from on-campus abuse by those who make up our community. When one person in our community is threatened, we are all threatened. A home ceases to be a home. No person should feel unsafe at home. Many people do not see the need for safe spaces because they do not feel unsafe. Those people are forgetting about the members of marginalized and historically repressed groups who do not feel safe. If you felt unsafe, you would appreciate safe spaces. A common critique of safe spaces is that it coddles the minds of young adults. But I, and most advocates for safe spaces, agree that all college students should indeed be challenged. Making safe spaces around sexual orientation, religion or race is not preventing students from being challenged: it is preventing them from being harassed. Within the framework of safe spaces, students can simultaneously be safe and challenged. However, people should ever be challenged about something which they have no control over, such as their sexual orientation or skin color. Maslow’s hierarchy of needs is one of the simplest and most well-known psychological theories, and it helps support the concept of safe spaces. The hierarchy is a pyramid with the most basic needs at the bottom and each level cannot be reached until the previous one is satisfied. Safety is second to the bottom as one of the most basic needs of the human experience, right after physiological needs such as air and water. Without safety, members of our society are limited and will not reach other needs, like belonging and self-actualization. The lack of safe spaces would inhibit millions of Americans from reaching their full potential as they are stuck fighting for their own safety, something so many of us take for granted. Safe spaces are likewise protected by Fordham’s Jesuit value of cura personalis. They promote the well-being of the whole person, mind and body. St. Ignatius would say that safe spaces are required to care for the whole person, and the entire society benefits from them. The idea of safe spaces is that they provide vulnerable members of community with environments where they can be themselves while advancing the national conversation to progress and be more accepting. Safe spaces do not prohibit anybody’s freedom of speech. They protect people from being verbally assaulted from vitriolic bigots spewing venomous messages meant to incite harm and pain. Fordham can sometimes be prone to a feeling of exceptionalism, but recent events have proven we are vulnerable to the same issues as any college campus. I have always been impressed with the student response to bias incidents like the one this month. However, condemning hateful actions after they occur is not enough. We must remember that if we do not make room for safe spaces on campus, there will be more incidents, and more students will be targets of hate, leading to a community where far too many are unsafe. Matthew Michaels, GSB ’17, is a marketing major from Hightstown, New Jersey.